A mosaic of religious and ethnic minorities thrive in Iraq’s northern Kurdish region. Yazidis have lived here for millennia. A monotheistic faith with Sufi and Zoroastrian elements, Yazidis claim theirs is the world’s oldest religion. After God, they venerate an angel king who takes the form of a peacock. “When Yazidi clergymen perform rites in this area,” says Sheikh Rasho Rasho Hussein, keeper of a Yazidi temple in the Kurdish town of Khanka Kavin, along the shores of the Mosul Dam on the Tigris River. The Anatolian tradition of imece usulü – people working together for the collective good – pervaded the Gezi Park protests that have rocked Turkey this summer. From the ban on selling food within the confines of the occupied park (where meals and snacks were distributed for free) to the volunteers who hovered around the Taksim Square area spraying liquid relief into the eyes of tear-gas victims, the protesters grew more defiantly cooperative with every effort made to disperse them. 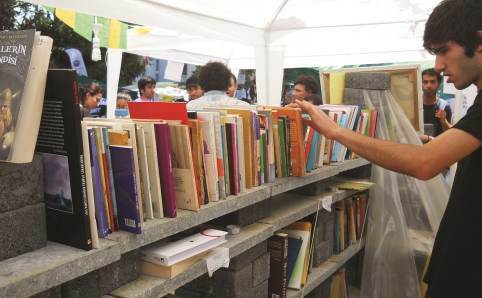 Exemplifying this spirit, the Gezi Library was one of the first institutions established in the commune-like environment that sprung up in Istanbul’s Gezi Park before it was cleared by police June 15. The library was introduced to the world on June 4, when requests for donations first appeared on social-networking sites. After that, thousands of books began passing through the library’s cinder-block shelves, comprising every genre from novels to textbooks, political magazines to encyclopedias. Similar libraries appeared in Ankara’s Kuğulu Park and İzmir’s Gündoğdu Square, both also hubs for protests.